On November 9, 1989, twenty years ago, after weeks of civil unrest and widespread peaceful demonstrations, East-Germans were allowed to travel freely to West-Berlin and West-Germany, resulting in the opening of the Berlin Wall. The Wall, the concrete barrier erected by the East-German government in 1961, separated West-Berlin from East-Berlin and East-Germany for more than a quarter century. Click here for some interesting websites on the history of the Berlin Wall from the Librarians' Internet Index. For a fascinating glimpse of Berlin in the 1920s, check out on DVD the documentary from 1927 titled BERLIN SYMPHONY OF A GREAT CITY. 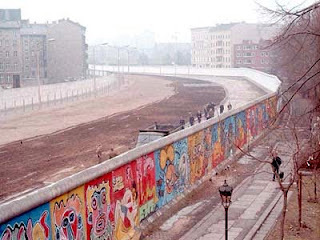 For books on the history of Berlin and the Berlin Wall, click here.